The tax system is one of the instruments said to be available to translate development policy objectives into practice. 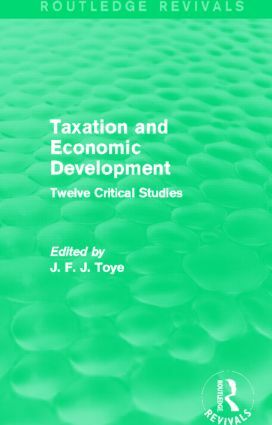 The wide-ranging papers collected together in this volume, first published in 1978, explore different aspects of the link between national development objectives and the tax system. Attention is particularly focused on traditional aims such as growth, fair distribution and economic stabilisation and development. Articles written by distinguished experts in the fields of public finance and economic development clarify the concepts of taxable capacity and tax effort, and examine the connections between growth and changes within the tax system.